If Bali was an adjective, it would define diversity. The serenity of its forested mountains, the spell binding charm of the waterfalls, the ferocity of its beaches, the enchanting vibe of its small restaurants and a culture of benevolence and honesty. This, all on a small island that one would easily cover from end to end in a day. Even with its dramatic ancient rice terraces, untamed jungles and lava spewing volcanoes, the landscape contrastingly evokes a sense of calmness, like a tamed lion. The people are friendly and kind, always wearing a smile. They bow their heads slightly with their palms joined together as if in prayer as a form of greeting, gratitude or while bidding farewell. I fell in love with the island’s charm and the warmth of its people, but what stole my heart the most was its profound simplicity. There was the simple yet stunning architecture. Every home in Ubud in the uplands of Bali is outlined by ancient stone houses with a small temple at the entrance. The people live simple lives; mostly as rice farmers going by the numerous rice paddies, or carpenters in a bamboo workshop where most of the wooden artefacts are manufactured. Their meals, mainly created around their staple food of rice, are simple yet delightful. My favourite was the Nasi Goreng Ayam which is merely fried rice mixed with chicken cubes and served with their signature fried egg. I loved how they would serve it for breakfast as well, for in Bali, anytime is rice time. Everything in Ubud is served in small portions, including the roads which are these narrow black tarmacked roads that wind like snakes. As one drives along, one minute there are rice plantations on both sides with the most beautiful shade of green and the next you are cutting through verdant hills filled with bamboo trees, banana and pawpaw plants. The roads take sudden descents and it feels like being on the desert safari, albeit in a forest. It’s magical, until you see an oncoming car and you realize that trying to fit two cars on these roads is harder than the proverbial camel going through the eye of a needle. The height of simplicity is amplified by Balinese names. There are only four of them shared by both men and women alike, a population of 4.2 million notwithstanding. The names are given by order of birth, with the first-born named Wayan, second Made, third Nyoman and fourth Ketut. We discovered this amidst such hilarity, when Nyoman our Villa manager who doubled up as our driver, had to attend his neighbour’s funeral on the afternoon of our fifth day in Ubud. We had hoped to have his services all day as our itinerary involved going to the iconic terrace swing, a visit to the elephant sanctuary, lunch in a local Indonesian restaurant and finally we would head to the beach town of Seminyak where we would spend our last four days. As such, Nyoman organised a replacement. At 9.47am, we wound up our breakfast of banana honey pancakes and fresh juice at our iconic villa. It was a bitter-sweet goodbye, leaving this massively gorgeous glass house behind with its wall to wall doors that afforded us stunning views of rice terraces. But knowing that we would get a different feel in Seminyak where we were headed, one of the beach nonetheless, made our goodbye less painful. At 10.27am, we were settled in our new van with our new driver. “Hallo ladies, my name is Nyoman. I am your driver for the day.” He said as he turned on the ignition. “You must be the other Nyoman’s cousin.” Said one of the girls to him. “Nyoman is a priend.” He chortled. It was funny how they all pronounced their f’s and b’s as p’s. Every morning, our hostess would come around announcing “preakfast is ready!” and we would choke on laughter. We found it intriguing that Nyoman had a priend with a similar name, but we didn’t think much of it. Until later on, in the evening, we went to this enthralling café in Seminyak called My Warung Pasang. Like many other restaurants we later visited, it had potted plants and creepers hanging from the roof next to these beautiful resplendent chandeliers. “Good evening ladies, my name is Nyoman. I will be taking your orders this evening.” A uniformed gentleman with a note pad and a pen in hand said as he stood over our table. “Hold up! Are there no other names in Bali?” I inquired. “Everyone we meet is Nyoman.” One of the girls added. Nyoman laughed at our frustration and went ahead to explain the naming system. If a family has more than four children, the cycle repeats itself, and the next Nyoman may be called Nyoman Balik, which loosely translates as “another Nyoman” haha. Our friends from Nyanza should borrow a leaf, what with Eurobond Onyango and Handshake Omolo. For an island that has refused to be modernized, it is amazing to discover that WIFI does not come in short supply. It is available everywhere including in village restaurants. What surprised me the most was its availability even in the neighbouring remote island of Nusa Penida that we toured during one of our days in Ubud. We drove for an hour to this sea front where we took a speed boat at a return cost of Indonesian Rupiah (IDR) 500,000 per person (USD 357, KES 3,600). It was a daunting forty minutes sail in an enclosed boat that cruised through the raging sea. We got to Nusa Penida and hired a van that took us round the island for a day where we snorkelled with these huge Manta fish and later had lunch. Nusa Penida’s inland was characterised by tall dry and emaciated trees and narrow roads. There were a few stone houses scattered on vast dry land and some cows grazing on dry grass by the roadside. It felt like driving through a village in Garissa. It was so remote that not a single restaurant accepted cards but guess what, they all had WiFi. Should you think of travelling to Bali, here’s a short guide that I have put together for a nine-day trip. The most convenient flight from Kenya is Qatar or Emirates. While Qatar was more expensive, we chose it as it had shorter layovers. Consider spending at least 17 hours on the move: 6 hours to Doha, one-hour layover and 10 hours to Bali. Metered Taxis are your friends! Much as the convenience of a hotel cab/van might be alluring, a metered taxi will be a quarter of the price. Consider paying IDR 100,000 from the airport to Ubud. Always insist on using the meter before getting into any cab. Unless of course they are entirely unavailable. Should you be landing in the middle of the night, it helps to book yourself in a hotel near the airport for the first night like we did. There are numerous three-star hotels that are dirt cheap with a four-star feel. It will save you the trouble of travelling to Ubud in your bushed state. And if you feel the need to explore the night life in this part, check out Sky Garden. It closes at 4am though. Visit one of the big rice paddies and soak in their unimaginable beauty, head to a coffee farm and learn how they use the Luwak animal to make the most expensive coffee in the world, take a Balinese cooking class and eat in a local Balinese restaurant. Head over to the terrace swings for the most terrifying swing ride you’ll ever get on, try out their equivalent of ziplining, grab a bicycle and see how well you can cycle this hilly island, hop onto a kayak and enjoy water rafting on a low-grade river and finally visit the elephant sanctuary to see the calmest elephants on the planet. You will need a Balinese massage after all these and they are available all over the place, for a song. 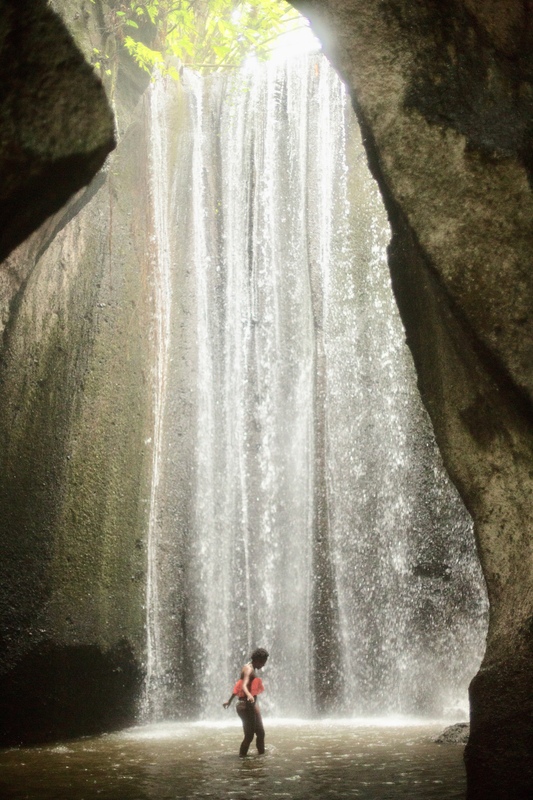 The iconic cave waterfalls in Ubud are unique and breath-taking. 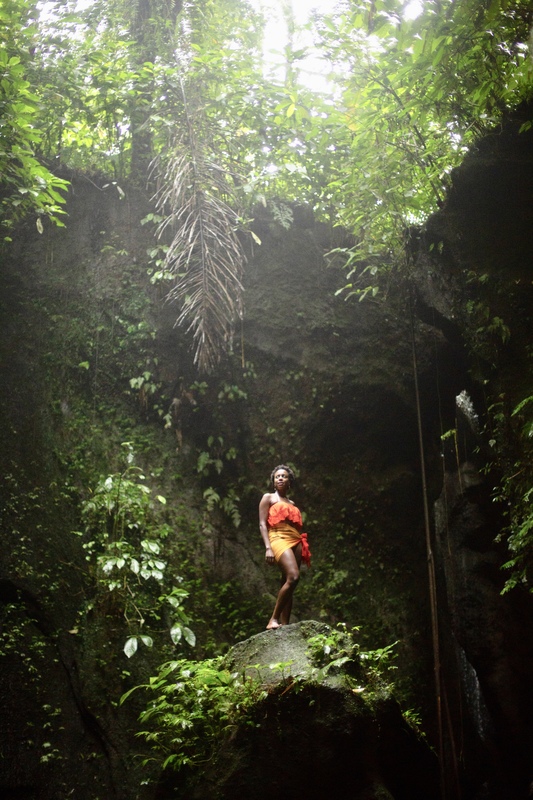 Carry a pair of sneakers as the walk down and up the caves is steep and can get slippery. Later, venture into the Sacred Monkey Forest, a lush jungle sanctuary. Don’t let the name mislead you as the monkeys there are like those roadside thugs in Kenya. They will grab anything that can come off you, like jewellery, food in your hands and perhaps even your wig haha. It’s time to check out their market, where you can get everything under the sun. From adorable straw bags and batik sarongs to beach wear, to household stuff like crockery and wall hangings, and cute mementos like bottle openers and fridge magnets. Don’t forget to bargain. When they quote a price, quote a quarter of it then meet halfway. Head over to Ubud town and have lunch in their quaint Warung’s, a name for a small restaurant. Indonesia is home to 17,000 islands and it would be a shame if you went to Bali and did not visit the neighbouring ones. A speed boat will take you there. Try Nusa Penida, Nusa Ceningan or Lombok. They have fantastic white sandy beaches compared to the black ones in Bali. It’s time to move over to the beach side and get your tan on. Seminyak will give you all that and more. Spend your days here trying out meals in their small charming restaurants and exploring the different beach hotels available. They are numerous, both the eateries and beach clubs. I suggest a minimum of three days. Make sure you catch the sunset at Finns Club or The Lawn in Canggu. Head back home and make more money for your next travel! Nimekwamia hapo day 9: reality awaits you. Lol! You have a way with words. I love me some Bali any day! Great description of the sights and sounds of Bali. Indeed makes you want to visit like now. Very well written especially the details…….how much should I make to afford me Bali? I had so much to say but I tried to capture as much as possible whilst also ensuring I stick within a certain word limit. Given a chance, it could go to 3,000 words! 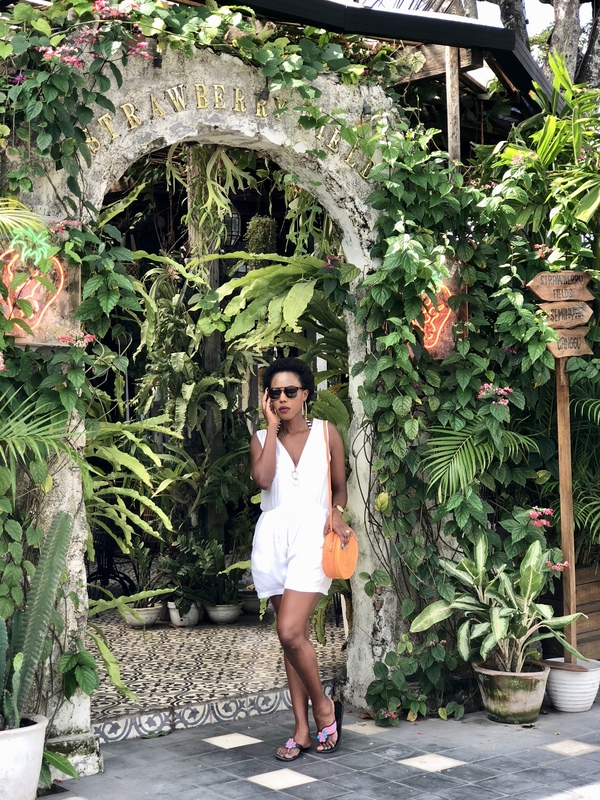 The flight is the major setback otherwise accommodation, food and excursions in Bali are cheaper than any other country I’ve been to, including Kenya. I want to go to Bali now! Let’s plan for next year. I wouldn’t mind going back! Riiiiight?! It seems absolutely incredible!! It was my best vacation ever! !